Theatre City Breaks, Eat Pray Laugh! Want a theatre city break? 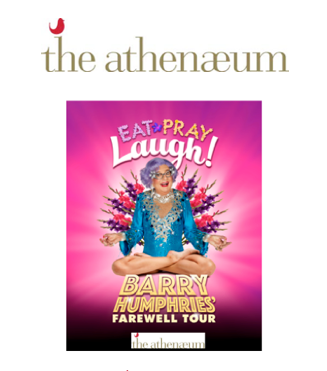 Well, The athenaeum hotel, located in the heart of Mayfair is delighted to announce its partnership with the London Palladium for Barry Humphries’ farewell tour, Eat, Pray, Laugh. An adieu for the world’s most treasured Australian comedian for the last 60 years, the production is set to be a sell-out, with fans from around the world keen to see famous characters such as Dame Edna and Les Patterson in action, live for the last time. In one of London’s finest locations, and known for its fun, unpretentious approach to five star luxury, the athenaeum hotel is perfect for guests who want to make the most of the acclaimed show. As part of the partnership, guests with the ‘Eat, Pray, Laugh – Stay’ package will be offered theatre tickets, a chauffeur driven 1967 Cadillac to the London Palladium and a delicious cocktail and canapé selection, inspired by the glitz and glamour of Dame Edna’s Australia. Gladioli, Dame Edna’s favourite flowers will also be in abundance in guest’s rooms, ready to be taken as a farewell gift for the eccentric star. “With its premium Mayfair location, and reputation as a luxurious ‘home from home,’ the athenaeum hotel is always a firm favourite for couples and families visiting the West End. As huge fans of Dame Edna ourselves we are delighted to partner with what will be another sell-out run of the acclaimed production. “‘Eat, Pray, Laugh – Stay’ at the hotel will embrace the glitz and kitsch glamour of the show, offering guests a playful and delicious insight into Barry Humphries’ wonderful and quirky world. We can’t wait.”, says Steve Margo, Entertainment Sales Director. DON’T YOU FORGET ABOUT ME.. Previous Post Comfortable shoes for women? Skechers are the solution! Next Post Hair tutorials: Get wavy curls in 15 minutes! Comfortable shoes for women? Skechers are the solution!